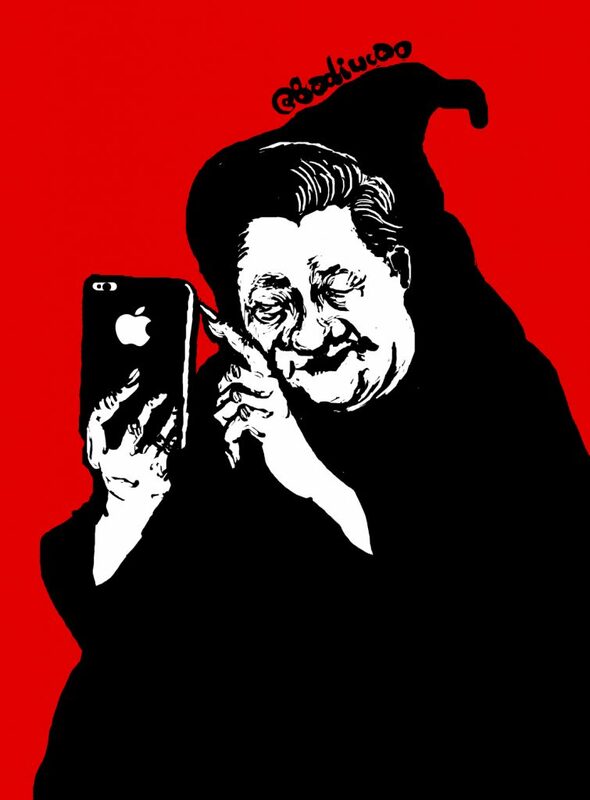 “The Poisoned Apple,” by Badiucao for CDT. [Despite being a symbol of middle-class ambition in China…] the iPhone has also become emblematic of China’s long reliance on foreign technology. Even before China passed the cybersecurity law last year requiring that the online data of its citizen be stored domestically, the country was pressuring foreign technology companies to operate its computer servers within its borders. Apple already stores some of the data of China’s residents in local servers, but the new agreement goes one step further with a Chinese partner responsible for running its data center, managing the sales of its services in the country and handling legal requests for data from the government. […] Foreign companies like Apple have had to adapt in other ways to stronger Chinese government scrutiny, often by helping to expand Chinese technological capabilities. For instance, Apple said this year that it would establish two research and development centers in China. Last year, it invested $1 billion in Didi Chuxing, a Chinese ride-hailing service. Apple has been far more profitable in China than most of its Western peers, but that success has led to pushback from the government. More than a year ago, Apple’s iBooks Store and iTunes Movies were shut down in China, six months after they were introduced there. This summer of challenge for the three companies [Facebook, Microsoft (who owns LinkedIn), and Apple] offers a broad illustration of just how varied the obstacles have become for foreign companies in China. They also show in stark terms why this vast market has been frustratingly difficult for outsiders. […] There are issues beyond offending censors. The Chinese internet culture is different, and at times quirky. And the technical requirements of China’s internet filters can make operating difficult. Engineers often have to find alternatives to the services technology companies rely on outside China. […] Yet keeping Beijing satisfied is only part of the challenge for Apple. With more and more Chinese smartphone makers selling high-quality smartphones cheaply, the company’s sales in the country have slid over the past two years. In the second quarter ending April 1, the company’s revenue in greater China fell 14 percent, even as the market remains critical. Greater China accounts for 21 percent of the company’s sales, making it Apple’s most important market after the United States. This isn’t a temporary tightening, but rather the new reality of President Xi Jinping’s internet. China’s censors have shown they can erase political criticism and dissent, and are now growing more ambitious, aiming to shape the world online to reinforce Communist Party values and morals. While embracing the efficiency and growth of the internet, what Chinese authorities want is an altered and nonthreatening version. “It’s a decidedly Orwellian moment for China,’’ says Jeff Wasserstrom, a Chancellor’s Professor of Chinese History at the University of California at Irvine. While Xi’s predecessors – Hu Jintao, Jiang Zemin, and Deng Xiaoping – focused on gaining public support by making people’s lives materially better, his government has put a more pronounced emphasis on winning hearts and minds. That’s evident in how often he’s personally mentioned in state media reports, prompting some observers to question if Xi favors the ideological, personality-driven leadership style of Mao Zedong over the pragmatic, collective approach of Deng.